Last week, we discussed the potential of a feature adaptation of Disney’s Gargoyles, a dark and Gothic animated serial from the mid-1990s. There was a good amount of support for the idea and more than a fair share of nostalgia for the property. To encourage more discussion in the comments, feel free to let us know if you think a particular adaptation is a good idea and why, who should star in the major roles and who is fit to sit in the director’s chair. This week, we’ll set sail for the distant waterworld of Mer in search of the lost Thirteen Treasures of Rule. If you don’t know what I’m talking about, hit the jump to find out. Hollywood! 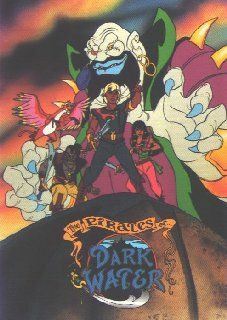 Adapt this: The Pirates of Dark Water. For decades, Hanna-Barbera was the king of cartoons: The Smurfs, Jonny Quest, Space Ghost, The Powerpuff Girls and Yogi Bear just to name a few (we’ll be revisiting Hanna-Barbera properties a LOT in the coming weeks and months). Easily lost in their long list of properties was the short run of a pirate adventure series that thrilled fans during its duration but ultimately left them unfulfilled when it was canceled. 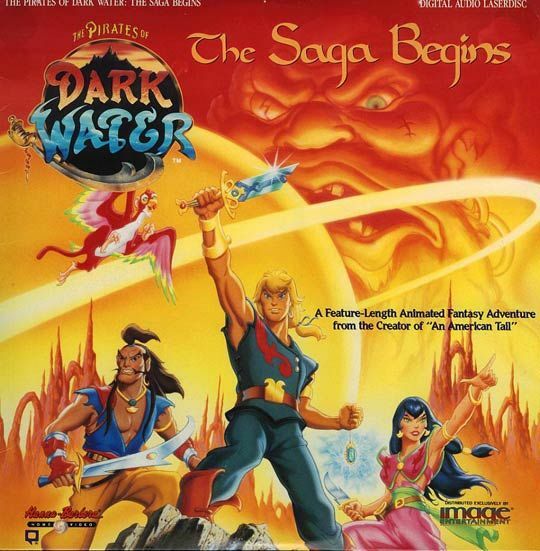 Let’s get into The Pirates of Dark Water. The original series from creator David Kirschner (An American Tail) debuted in 1991 as a five-part mini-series. Later that year, the episodes were re-run (with some minor tweaks) and kicked off the series in earnest. 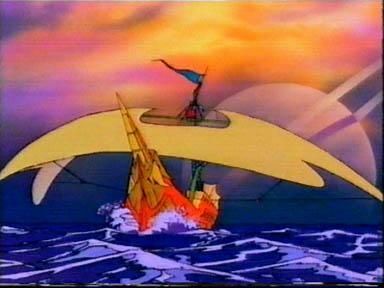 The Pirates of Dark Water introduced viewers to Ren (voiced by George Newbern), a young lighthouse keeper who rescues a man from drowning when he washes ashore. The man turns out to be Primus, rightful ruler of the crystal island of Octopon and Ren’s father. With his dying breath, he tells Ren about the Dark Water that threatens to cover all the land and gives him a magic compass that will lead him to the Thirteen Treasures of Rule, the only way to defeat the darkness. His last gift to Ren comes in the form of a broken sword which plays a part in restoring order to the world. Unfortunately for Ren, as soon as he learns about his heritage and destiny, a winged-creature crashes through the lighthouse window and carries him away. 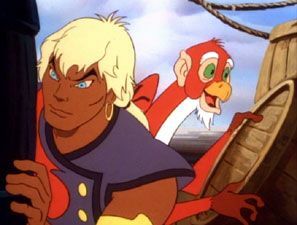 The monkeybird known as Niddler (voiced by Roddy McDowall and Frank Welker) works for the evil pirate lord Bloth (voiced by Brock Peters), a massive villain who captains the Maelstrom, which dwarfs any other ship on the twenty seas of Mer. Bloth is obsessed with three things: finding the lost treasures to control the Dark Water, using them to rule the planet and eliminating the heir to the throne of Octopon. Bad news for Ren. The good news is that Bloth is a vile man and his men have no love for him; monkeybirds have even less. Ren and Niddler strike an accord and Niddler flies the young prince to safety. The unlikely duo then seek a ship to transport them in their search for the treasures. 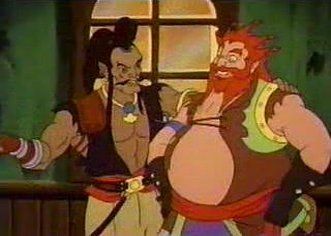 They happen upon Ioz (voiced by Hector Elizondo and Jim Cummings), a rogue and a pirate who has an ugly history with Bloth and is interested only in treasure. He leds Ren and Niddler to The Wraith, a swift ship that will serve their purpose splendidly. (Ioz momentarily forgets to mention that he’s actually stealing the ship from a fellow pirate.) Another surprise awaits the crew on board as Tula (voiced by Jodi Benson), has stowed away on The Wraith. Introduced as a simple barmaid, Tula is revealed as an ecomancer, with powers over the elements and biological life. She, like the rest of the characters in Pirates of Dark Water, is much more complicated than she appears. So there you have it! The conceit, the heroes and the villains all set up nicely in the first half-hour! By the end of the 21 episode run, Ren and his crew had visited numerous islands, taken on a number of side quests, gathered eight of the thirteen treasures of Rule and freed half of Mer from dark water. But due to a combination of factors (expensive animation style, poor ratings and a takeover of Hanna-Barbera by Turner, to name a few), the show was cancelled without ever completing the quest or giving fans closure to the fate of the world of Mer. Could / Should It Be Adapted? However, even PotC spent a good portion of their screentime on land because filming water scenes tends to jack up the cost by quite a bit. PoDW ‘s alien world of Mer is mostly water and a LOT of cat-and-mouse chases happen between the Wraith and the Maelstrom over the course of the series. Not to mention the dark water’s presence and dispersal by the treasures. While the treasure-seeking can take place on land, a huge part of the production would be on water. But hey, there’s also big franchise potential to look at as the quest would take place over at least three movies. So should this property be resurrected? Absolutely! It’s Pirates of the Caribbean with a plot people might actually care about. It’s a classic coming-of-age story intertwined with treasure seeking, high adventure on seas swarming with pirates, the struggle of heroes against a faceless evil that threatens the world and a study in complex characters that evolve/betray/seduce/save each other over the course of the story. What more could you want?? I absolutely adore this show and it breaks my heart that the story was never finished. A feature (or, likely, features) would go a long way towards filling a hole in my nostalgia from childhood. Kirschner is still active in Hollywood (though why he’s producing the Direct-to-DVD Curse of Chucky, I’ll never know), so there’s the slimmest of chances of getting this some attention again. Of course it will need some modern touches and I think that goes without saying for any of these revisitations. But the core of the story is strong and high concept and is tailor-made for a feature adaptation. As to who I’d like to see at the helm, James Cameron brought the world of Avatar’s Pandora to life in a stunning fashion and I’d love to see him tackle the alien world of Mer (though, if rumors prove true, we may see a watery side of Pandora in one or both of the upcoming Avatar sequels). Unlike last week when I proposed keeping the Gargoyles voice cast in tact for the possible feature adaptation, The Pirates of Dark Water will require flesh-and-blood actors. At the risk of white-washing the cast, I’ll say (grudgingly) that Zac Efron looks the part of Ren and is young enough to pull it off. (Go ahead and fire off the hate in the comments now. I fully expect it.) I’m not uber-familiar with Efron’s work, but I don’t doubt that a studio would at least consider making him a franchise leader. As for Ioz, how about Danny Trejo? (Did I win you back with that one?) He’s a tad on the old side for Ioz, who is supposed to be more of a big brother to Ren than a father (or grandfather), but I’ll be damned if he wouldn’t make a good Ioz. I’ll probably lose you again with my suggestion for Tula: Glee’s Lea Michele. I think she’s got the look and might welcome the opportunity to move on from the musical series. As for Bloth, what’s James Gandolfini up to these days? I know I’ll get you on my side with this one: Niddler, as played by Andy Serkis. ’nuff said. The alien world of Mer is being devoured by Dark Water. Only Ren, a young prince, can stop it, by finding the lost Thirteen Treasures of Rule. At his side is an unlikely but loyal crew of misfits; at his back, the evil pirate lord Bloth, who would stop at nothing to get the Treasures for himself. It’s high adventure with The Pirates of Dark Water! Let us know your thoughts in the comments. Anything goes: is this a good idea? Who should play which part? Am I way off target on my casting/directing choices? Then, be sure to check back next week when we revisit the adventures of a boy, his dog, his adopted brother, his genius father and the family bodyguard!